"The time has come to hold Oracle accountable for its failure to deliver technology that worked on the timelines the company committed to," Kitzhaber said, according to prepared remarks delivered to the state legislature on Thursday. "I believe the law is on our side. I believe justice is on our side,” he said. 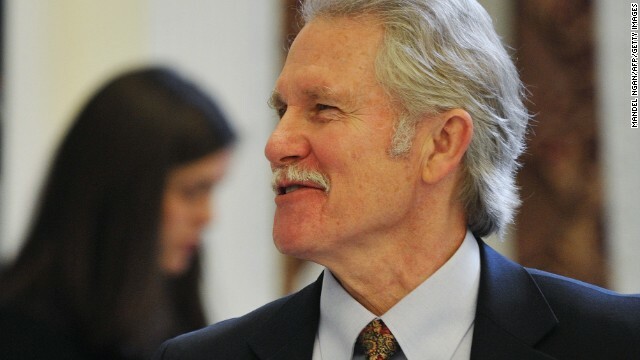 Kitzhaber also reached out to the federal government over the controversy in a letter to Health and Human Services Inspector General Ellen Rosenblum. He also pushed Oregon Sens. Ron Wyden and Jeff Merkley to help reclaim funds paid to the company. In the correspondence to HHS, the governor notes an internal review's finding, which determined steps needed to improve the health care program. "I have acted on the findings with a series of actions and reforms," he said. "Now it is time to hold Oracle accountable for its failure to deliver a working website." Oregon dropped its state-run exchange, opting to join the federal HealthCare.gov option in April. The governor told the legislature that he didn't take legal action earlier because he was focused on fixing the problems first. "I have prioritized cleaning up our own house before reviewing and commenting on the performance and failings of Oracle, Cover Oregon's primary website developer," he said. The company on Thursday placed blame with the state, which it says "badly mismanaged the project by consistently failing to deliver requirements in a timely manner and failing to staff the project with skilled personnel." "We understand the political nature of the announcement just made and that the governor wants to shift blame from where it belongs," the company said in a statement. Just wait a min . They finally had to read it and then probably stroked out when they knew they could'nt fix all that stupid stuffed program . Thank a Dem for long lines poor care and the n0t so ACa . Im heartsick for us . Its just plain unamerican to makeup junk like this . It's about time to sue these private contractors who think government's job is to provide corporate welfare. I don't recall these types of problems when govt employees did this work. Sort of the same way things turned-out after replacing Marines with Blackwater for security. The proper thing to do is sue the federal government for cramming Obamacare down our throats. Good luck getting money out of Larry Ellison . Oracle is the equivalent of Halliburton , no bid government contracts , when threatened they turn nasty . When you talk about banks to big to fail , you should also talk about suppliers and networks to big to loose contracts . So the Governor Kitzhaber doesn't know what a time and materials contract is or how it works. Next thing you're going to tell me is that he can't pump his own gas...oh...OH. Now that they have been CRUSHED by Turtle McConnell, can't wait to see Thom Tillis,Sheldon Adelson,Rupert Mourdoch,Karl Rove,Grover Norquist and the GOP stuff Jeb Bush down the tea party's throats EXACTLY like they stuffed Romney down. What? The private sector didn't do a better job than the federal government? And, people want to allow private companies to do more of what the government does? Go get 'em Governor. If they failed to deliver services rendered, then go after the cash that you have tendered.